Wabash men not only try to live humanely, but help others do so as well. Six Wabash alumni traveled to Noblesville Saturday to assist with the renovation of a facility for pregnant and parenting teens organized by the Hamilton Centers Youth Service Bureau (HCYSB). The project was part of the third annual Wabash Day community service project in which alumni all over the country participate in their communities. See Noblesville photo album here. The HCYSB is a private, non-profit agency founded in the 1970s to provide shelter and support for abandoned, abused, homeless, or pre-delinquent youth in Hamilton County, Indiana. Its initiatives address the physical, social, emotional, and educational needs of troubled and at risk youth and families. The Pregnant and Parenting Teens Program offers a residence assuring a structured, supportive, and safe environment for the teenager to learn and grow. Wabash Group Leader Greg Estell ’85 organized the event with the help of his wife, who is a HCYSB board member, and HCYSB Executive Director Stephanie Lyons. "We provide positive adolescent development and delinquency prevention programs for youth in Hamilton County and the surrounding area," said Lyons. "The alumni are helping us prepare a home to house pregnant and parenting teens that will open in January. It means a lot. We’re actually doing a full renovation on the house, utilizing volunteer labor. And to be able to do a full remodeling is time-extensive. So we need all the volunteers we can get, and having the Wabash alumni here is great help." With a Wabash flag hanging from the porch, passersbys could see the men sweeping, painting, staining, and all manner of home improvement activities. 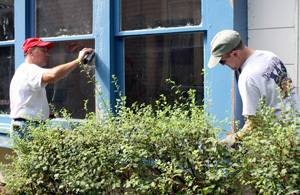 Kevin Pastore ’95 and Scott Quick ’88 were working on painting the formerly blue window trims tan. 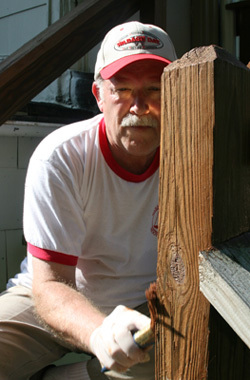 Brad Johnson ’71 focused on staining the outdoor staircase to the second floor. Inside, Jared Stark ’94 sanded walls to prepare them for paint. The house was built in the 1920s and functioned as the home for a residential program for status-offending youth. It is full with toys, bathroom equipment, pipe fixtures, and paint. "When this gets done, this will be a home for pregnant and parenting teenage mothers," said Greg Estell, Fishers. "It’s important to provide service back to our community. And if we can pull Wabash men together to have some fun and do some good, we can’t go wrong." "[Wabash Day] is really a phenomenal idea," said Scott Quick, Zionsville. "I know Jon Pactor was one of the driving forces. Jon and I have been on the local Indianapolis Association of Wabash Men board for ages, and Jon also serves on the National Association of Wabash Men (NAWM) where this idea kind of came back down to us. It’s a really inspirational thing to see alums all around the country banding together today to make somebody’s life –some stranger’s life- a little better. We’re giving this place a thorough makeover and hopefully make it a nicer place for some women who need some help." "Wabash day is a great opportunity," said Brad Johnson, Indianapolis. "Particularly with the NAWM to have a project focused on community service. It’s consistent with the college mission. It’s what we try to train young men to do. Alumni are trying to do it every year to demonstrate it." "This is my first one," said Kevin Pastore, Fishers. "It’s because of the emails that have been out in the past about previous Wabash days that I got involved with this one, just to see what it’s like and all the different groups around the country that are able to come out one day and represent Wabash and do something good for the community. Anything that can help teach survival skills for single parents, especially young single parents; anything that’s going to help them to get by and help kids thrive is well worth the effort. "I think it’s great," said Jared Stark, Westfield. "It’s a great opportunity to get the name of Wabash out in the community, but also give back to the community in which we live. It’s certainly a worthy cause."